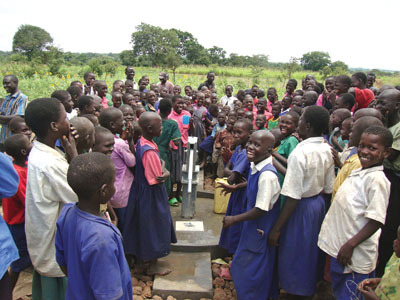 Wells of Life is a five-year-old 501(c)(3) organization dedicated to providing clean, safe drinking water wells in rural Uganda. It has drilled almost 150 wells during its startup period, with a goal of drilling 1,000 wells in 10 years. It is currently providing clean water to schools and villages, helping to preserve the health of more than 150,000 children and their parents. The organization’s work allows mothers to spend time with their children—time that would otherwise be spent hauling water—and allows kids to go to school, helping to raise the living and educational standards of the villages. The organization believes that all people everywhere deserve, at a minimum, decent water. It prides itself on complete financial transparency in its financial disclosures, all of which are posted on its website. The charity raises money in $6,000 increments, and every penny goes directly and only toward drilling a well, which is complete within six months of the money being raised. A permanent carved stone plaque is cemented in place at each well with whichever inscription the donor desires, and for the next 25 to 30 years, the women and girls in the village will be spared the backbreaking journey of several miles several times a day to deliver contaminated water from a surface source. This allows the girls to join their brothers in school, thereby providing more children in this developing nation with the opportunity to become educated. Clean water allows the children to live without fear of waterborne diseases like trachoma, which destroys the cornea of the eye, leading to blindness. After a well is drilled, the organization returns periodically to test the water quality and verify that it is still operating properly. Most of the wells drilled by Wells of Life have been financed by individual families. One of the most generous, but in many ways typical, is the Martin family of Orange County, Calif.
Mike Martin graduated from California State University, Long Beach, and became a city of Santa Monica police officer. Amber Martin attended California State University, Fullerton, and was working as a police department volunteer when she met Mike. They married in 1999, and contracted with realtor Nick Jordan to help them find their first home. The Martins later went into the real estate business themselves, and remained close friends with Jordan. 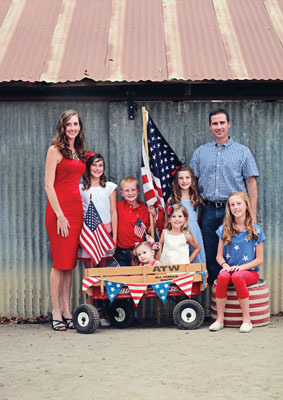 When Jordan started Wells of Life, the Martins expressed interest in working with the charity. Wells of Life utilizes PAT-Drill 301 TPs drilling rigs, CompAir compressors and India Mark II hand pumps for the wells it drills. It is estimated that 60% of wells built in Africa are currently not working, and that 50% of wells fail during the first six months and are never repaired. This is a problem that those in the water sector are aware of and many are trying to solve. Wells of Life’s old philosophy was that the problem could be solved by periodic inspection of drilled wells (this is still done on a “spot check” basis), but now that volunteers have been on the ground in Africa for the past several years, it views this issue slightly differently—the issue is less about monitoring than it is about empowering communities to manage the wells themselves. Wells of Life sends water from each of its wells to be tested at the government water testing facility in Uganda’s capital city, Kampala. By law, Wells of Life must handle the testing in this manner because its drilling partners are registered nongovernmental organizations. Wells of Life also found that many in-field water testing kits do not cover all of the testing parameters required by the government. In order to ensure that water samples stay safe until they can be tested, one of the drilling partners installed a portable fridge in one of the organization’s trucks. Drilling a well usually takes one to two weeks, but the preparation time can be months. 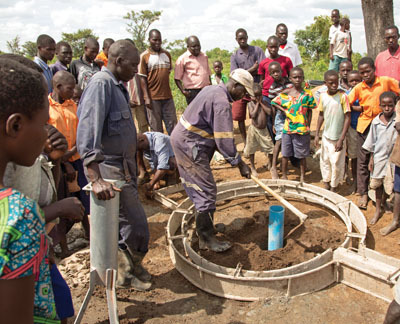 The organization ensures that a community is ready to responsibly maintain its well before drilling begins. Part of the preparation entails the community forming a water users group that includes women in decision-making positions. The group receives training on basic finances, bookkeeping and setting up money-making initiatives, a process that usually takes at least three months. The organization drills where there is a need. 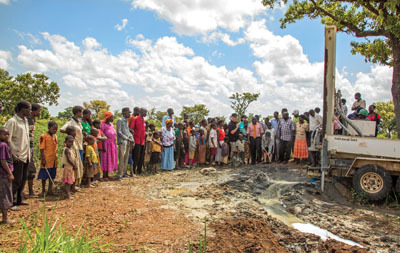 Factors that go into the decision of where to drill a well include the proximity of the next water point, how many people live in the community, how many children live locally and the likelihood of finding water in that area. The drilling partners carry out hydrogeological surveys at each well to estimate how deep the water table is, and how much water is likely to be there. Peter Callahan is president of Wells of Life and partner for Callahan, Thompson, Sherman & Caudill LLP. Callahan can be reached at [email protected].